Let's face it. Nothing seems a bigger nuisance than when a well-meaning amateur decides to try his hand at the work of a professional. Just ask Mr. Poirot, or, in the case of Sins of the Fathers (1967), Chief Inspector Wexford. Wexford feels nothing but annoyance when the Reverend Henry Archery goes poking into a grisly case of axe murder that Wexford closed more than twenty years ago. It's an imposition that Wexford never would have tolerated had it not been at the Chief Constable's insistence. 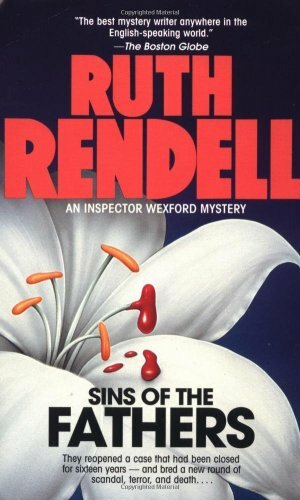 And so we see little and hear less from Wexford, his nose out of joint, in this second in the series that features the prickly chief inspector and his more tractable sidekick, Mike Burden, by Ruth Rendell. Instead the focus is on the desultory investigations of Henry Archery, whose son wishes to marry the daughter of the infamous axe murderer. Archery would like to prove the man, who has already hanged for his crime, innocent. Barring that, of course, Archery would stop the marriage. What turns up in the course of Archery's questionings opens the eyes of more than just the residents of Kingsmarkham, where no one and nothing seems to be quite as it should twenty years hence. Miss Lemon's readers have no doubt noticed the plural indicator in this aptly titled novel: for as the Reverend Archery himself discovers, not even the most chaste of men are immune to the frailties of the human condition -- a discovery, Miss Lemon might add, that makes Archery that much more sympathetic and gives the novels an absorbing subplot. 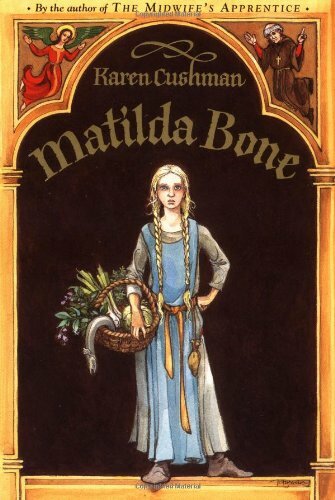 Another treasure unearthed during Miss Lemon's recent move is Matilda Bone (2000), a first-rate historical novel for children, now mostly forgotten, by Karen Cushman. Well, perhaps this novel is not so much forgotten as overshadowed by Ms. Cushman's other historical works, particularly The Midwife's Apprentice and Catherine, Called Birdy, for which she won the Newbery Medal and the Newbery Honor awards. In this novel, we meet Matilda, orphaned by her natural parents and raised by Father Leufredus in a comfortable estate, as she's unceremoniously dropped in Blood and Bone Alley in a small village between nowhere and nothing, while Father Leufredus takes himself off to Oxford and higher learning. Sure that he'll be back for her, Matilda turns up her nose at Red Peg, the bonesetter, of Blood and Bone Alley, her trade and the miserable cottage she lives in. Made to sweep the floors, stoke the fires and mix the poultices, Matilda spends her time mumbling about injustice and praying for deliverance. What, one may well ask, does this children's fiction have to do with British mystery? Well, for Miss Lemon at least, the medieval period of our history has always been a source of fascination and mystery. So many myths abound: that most all people living in the so-called dark ages were peasants, a hoi polloi who were dirty, ignorant, inept and indigent hovel dwellers without wit, sense or taste. Matilda Bone makes short work of most of our modern misperceptions in a way that is wry and poignant. Miss Lemon especially likes the heroine of this novel, Matilda, because she, like (let's face it) all modern children, is deeply flawed, especially in her inflated sense of self. Always aiming 'for higher things,' like her idolized Father Leufredus, Matilda soon sees that calling on the saints and speaking in Latin do little to help avoid being bilked at the fish market or comfort an ailing friend. It's sad that we, and Matilda, never hear from Father Leufredus again. But his untimely exit leaves the door open for Matilda to learn the difference between theory and practicality; and she grows, albeit stubbornly, to appreciate a few small joys of this earthly realm. Matilda Bone, Miss Lemon thinks, is a gentle yet absorbing reminder that those who lived in 1143 are scarcely different from we who live today. Egoism, superstition, deception and fraud were just as alive then as they are today. So were intelligence, compassion and genuine friendship. Miss Lemon begs her readers' pardon for her long silence. No, she wasn't enjoying an extended holiday in Biarritz. She was moving house! A daunting task, one must agree, for those who collect British mysteries in the quantity that Miss Lemon does. 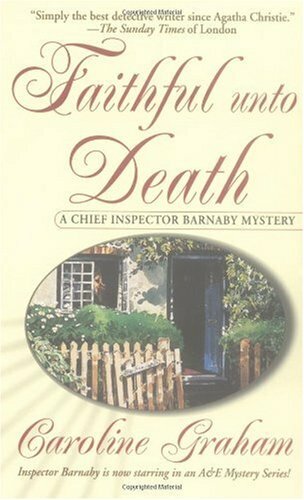 Whilst un-shelving, organising and re-shelving her treasured possessions, Miss Lemon came across Faithful unto Death (1996), the fifth entry in the Inspector Barnaby series, and she enjoyed every second of it. In this installment, Barnaby and his smug bag-carrier, Sgt. Troy, are tasked first with the disappearance of Simone Hollingsworth, the docile-seeming wife of an aggressive technology entrepreneur, and then, later, Alan Hollingsworth's suspicious suicide. Thrown into the mix is the brutal hit-and-run that kills Deborah Brockley, an awkwardly plain 30-something spinster and neighbour of the Hollingsworths, who harbours surprising secrets of her own. Are these crimes connected? And who could be the author of such callous violence in a village as quaint and placid as Fawcett Green? The solution certainly surprised Miss Lemon. Like all of Caroline Graham's novels, Faithful unto Death is witty and well-crafted and stuffed full of quirky characters shrewdly drawn. A perfect diversion from relocation stress.